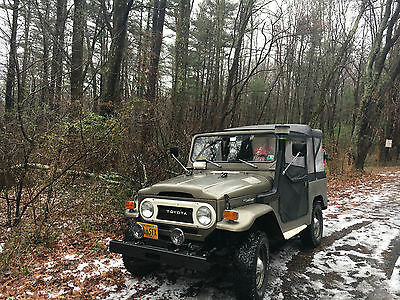 What I have for sale is a rebuilt (not frame off) post 9/75 Toyota Land Cruiser FJ40. This is a beautiful truck that has had A LOT of work done to it. I just returned from 500 miles of highway, beach and small town driving. This truck cruised at 65-70 mph (appx. 12-14 mpg) and the 4x4 engaged smooth and strong. It's my daily driver and can be your daily driver as well--so the mileage will vary slightly when you get it--you just have to like stick shift! It starts up, drives, and is damn near BONE STOCK. It's clean, very little rust (the small amounts are surface). I bought this from a barn in PA and luckily it was rhino-lined inside and out -- after that, I've completely rebuilt her. Most of this work was done by Black Wolf Auto in Woodbridge, VA and Trademark Classics in Harrisburg, PA. SOME of the work done (yes, I have the receipts):Engine: 1. Completely rebuild the 2F engine. This is bone stock. Drives perfectly -- starts every time -- has about 3k on the rebuilt engine. 2. Brand new alternator from 84 FJ40 -- internal regulator increases voltage to 60 amps. 3. Brand new high volume radiator -- this engine will not overheat. 4. New Distributor and distributor cap. 5. Rebuilt gearbox and transfer case. 6. Safari Snorkel with safari pre-snorkel, stock (1984) filter installed inside the vehicle. 7. New 38mm Carburetor timed for the vehicle. Works great. 8. Just pulled the crank shaft and redid all of the seals - does not drip oil, does not smoke. Oil pressure is perfect. 9. Dash mounted kill switch for when you leave your car in the city. 10. New spark plugs.11. Petronix electronic ignition.Suspension: 1. Rebuilt brand new tie rods/ends -- no worries there. 2. New Toyota shocks (recommended, but you could easily go to Bilstein especially if you wanted to lift her).3. HFS steering stabilizer that works and looks great. 4. JTO Outfitters disc brakes up front and rebuilt stock drums brakes in rear (keep it original!) -- no troubles slowing down the 2F in DC traffic. Interior: 1. Reupholstered front seats -- I keep them covered. The rear seat is a bench seat that folds down.2. Tuffy box installed -- cup holders are in the rear. (I also have the original that is in great shape).3. BTB Box front locking box installed in place of dash pad.4. New Aussie mat fitted and installed with new transfer case/shifter boot.5. Used (but great shape) rear OEM Toyota hard mats. Externally:1. JTO Outfitter winch ready (looks super stock) front bumper. 2. Specter Off-Road rear swing out with dual jerry can holders (included), Hi-Lift Mount (included), axe and shovel handels and lighted license display. 3. CCOT rear tailgate installed.4. Safari Snorkel with Safari Pre-fileter (The regular pre-filter is included). 5. Besttop softtop with soft doors (half-doors/full-doors) and also the normal hard doors. 6. New windshield wipers, wiper reservoir, and hardware (wiper fluid is intermittent for some reason).7. Brand new Hella Black Magic fog lights -- with dual internal switches.8. New Toyota/4x4 logos and rear flares installed on passenger and driver side.9. CCOT front license plate holder.10. Front Wheeling Hooks on bumper.11. Front Stock "hard" doors come with the vehicle, painted the same color. The driver side window has a crack in it (appx. 100 to buy) but the window regulator works just fine. 12. This car was repainted in a sort of Willys/military paint job. It looks good but if I held on to it, I'd bring it back to Arctic white (original color). Some chips, some bubbles, but this car gets looks and folks generally lose their mind when you drive it. That's a list of work done -- but I'm sure I'm leaving something out. It's a damn strong runner and will continue to be forever -- just depends on how you maintain her. You could put 10k into this and sell it for 50 or drive it for the next 20 years as is -- everything works very well. I have clean title (titled in VA) and passed safety inspection (No need for emissions). Car is tagged and titled in VA. Vehicle is in excellent running condition. Still runs like new, actually. Has received regular oil change and service tune-ups. Even after 200,000 miles, I expect this car to run for another 200,000 more. One of the most reliable cars made in the last 20 years. There's a reason why people keep coming up to us in grocery store parking lots to ask to buy our 15 year old car! So now we're finally selling it to get a more compact car. Our loss can be your gain!! !Price reduced to $4,500 OBO. Would like to sell this quickly to a good home. All reasonable (and serious) offers will be considered.FEATURES/OPTIONS:Variable 4WDOverdriveElectronic Control Transmition (ECT)Cruise controlRemote starter (so you start the car from inside the house to warm it up in the winter)Kenwood KDC-BT555U (radio/Bluetooth/CD) w/removable faceplate, USB port, remotePower windows, locks, mirrors.Original paint (still in great shape)Tires replaced last year (see photos).ISSUES:Some rust on rear bumper, frame.Power antenna has been disconnected. (Radio reception still works fine, but antenna doesn't automatically go up and down).Right rear view mirror housing chipped (see photos).Typical wear to interior fabrics (see photos).Slight dent on rear bumper (left side - see photo). 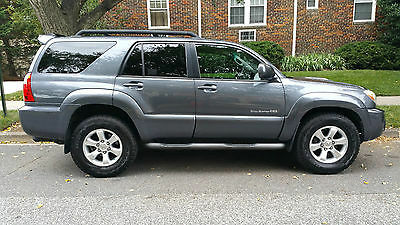 This is a 2006 Toyota Sport Edition 4Runner V6 4x4 with a 5 speed automatic transmission with a bit under 86,000 miles. It runs great and has zero mechanical issues. It has a fresh engine air filter and in cabin filter. The tires are new with only a few thousand miles on them. Because this is a V6 and has a timing chain, no timing belt replacement is needed at 90,000 miles. As far as options go, it has power front seats, power windows (including the rear tailgate window) and a power sunroof. 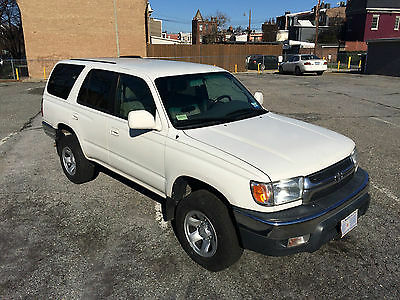 It also comes with the factory tow package, running boards, 6 CD changer, auxiliary audio input, and rear fold flat seats. The body and interior are in great shape except for the minor issues mentioned earlier. 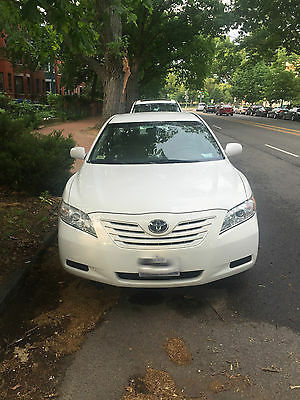 The driver side profile photo points out the 2 exterior issues. It is a super smooth driver and feels far tighter than the non-sport edition 4Runners. Given this and the great, smoker-free condition of the interior it feels like a much younger car.